It is very important to be exact and accurate at the measuring. If tailoring with fitting is supposed, inaccuracies of measurements will be corrected on fitting stage. At the remote tailoring we can be guided only by the standards measured by the customer, it is better to photograph process of measuring — it will allow us to correct values of the inexact measurements. For correct result the gymnast has to be in underwear or the tight-fitting training clothes. It is ideal if it will be a bodysuit which the gymnast puts on under a leotard for competitions. Measurements are taken closely to a body, without tightness, but also without additional freedom. For exact positioning of several main measures it is necessary to tie an elastic rope on a waist of the gymnast. 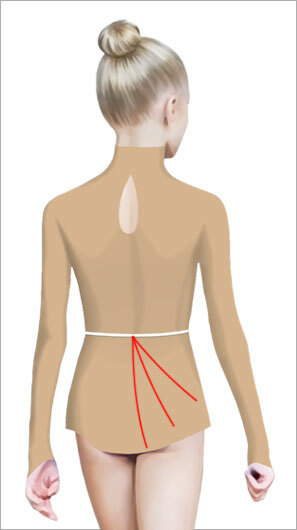 Impossible to take measurements of "Back" and "Rise (crotch depth)" correct without elastic rope on a waist. Be attentive, don't neglect it! 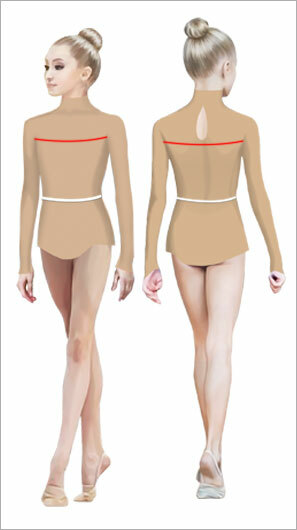 In creation of a pattern of a leotard for rhythmic gymnastics the measure "Heght" isn't used. She is necessary to us only as information. Put the tape-measure under the armpits, place it horizontally on the breast protruding points. Adult gymnasts formed breasts takes three measurements - on the chest, on the protruding points of the chest and under the breast. It is desirable that the gymnast was in the bodysute, which she wears under a leotard for the competition. The measurements are taken horizontally across protruding buttocks points. The measurements are taken at the narrowest point of the neck. 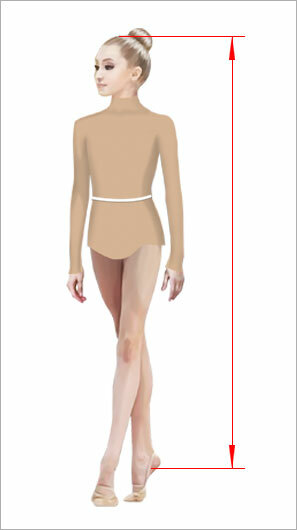 On the basis of this measurements is built collar of the leotard if measurement will be more than in the narrowest point of the neck, the collar will not be fit good the neck. The measurements are taken from a jugular hollow to a point on a neck where to the gymnast will be comfortable the end of a collar, usually this point in 1-2 centimeters below a chin. It is extremely important measure for creation the pattern. It is obligatory to take measurements with the elastic rope tied on a waist. The measurements are taken along a backbone from the seventh cervical vertebra before crossing with an elastic rope on a waist. The measurements are taken on the central line from crossing with an elastic rope in front before crossing with an elastic rope behind, having passed a measuring tape between the gymnast's legs. It is measured from the highest bone on a shoulder (an extreme point of a measure "Shoulder width"), through an elbow to a wrist as a first measurement and the second - to visually harmonious point of the end of protruding elements of a sleeve (usually this point is 3-4 centimeters lower than a wrist point). Measure on a straight arm around the bicep. The measurements are taken at the beginning of the wrist. For this measurement we need to find in the front or on the side the most comfortable point on top of the curve of the pant. Take vertical measurement of the distance from the found point to an elastic rope on a waist as the first vertical measurement; and from this point of intersection with an elastic rope to the center of a waist in front as the second horizontal measurement. The three measurements are taken consistently from the center of a waist on the back to comfortable points on the curve of the pant behind. It is measured on the central line in front from an elastic rope on a waist to a desirable bottom edge of the skirt. It is measured on the central line behind from an elastic rope to a desirable bottom edge of the skirt. For this measurement it is necessary to put the gymnast on a chair, the measurements are taken on a sideline from elastic rope on the waist to the chair surface. 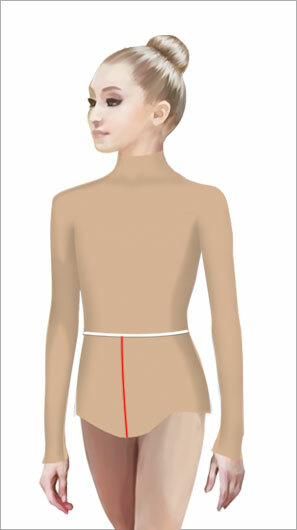 The measurements are taken in the top third of a leg. The measurements are taken in the bottleneck of an ankle. The measurements are taken at a position on the toes.